I’m thrilled to be joined around My Messy Desk today by my friend and fellow WORDNerd, Misty Keith. 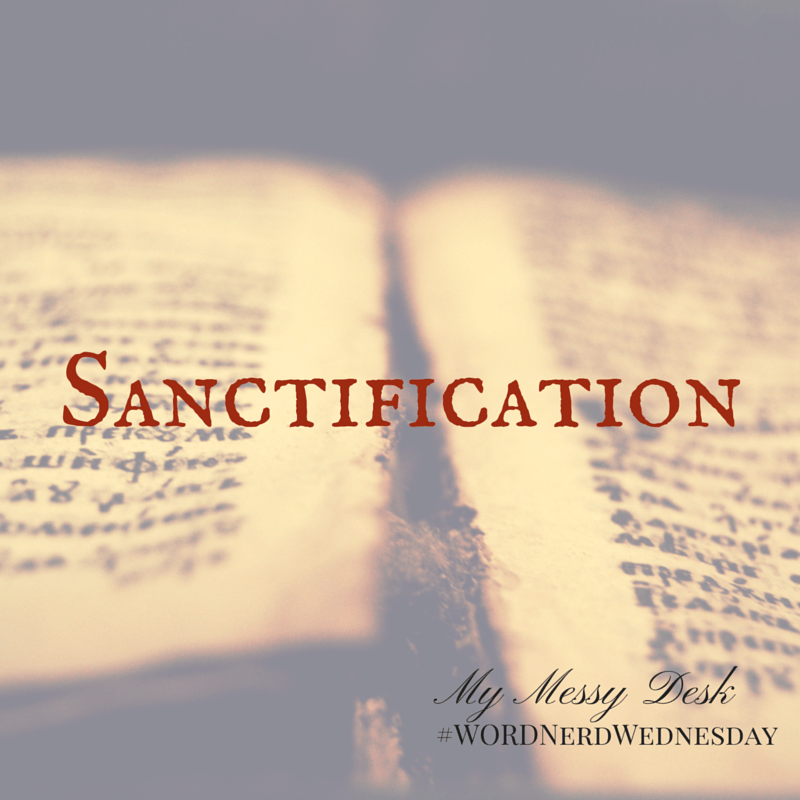 sanctification – Comes from the Latin verb “sanctificare.” Sanctificare is derived from sanctus “holy” and facere “to make.” In its verbal form, the word is sanctify. The Greek word translated “sanctification” (hagiasmos [aJgiasmov”]) means “holiness.” To sanctify, therefore, means “to make holy. 1. The literal meaning of sanctification is “to set apart” for special use or purpose, to make holy or sacred. 2. The act or process of acquiring sanctity. 4. The referral to a person becoming holy. The word Sanctification appears in the Bible ten times, sanctified appears twenty-four times and sanctify appears nineteen times. 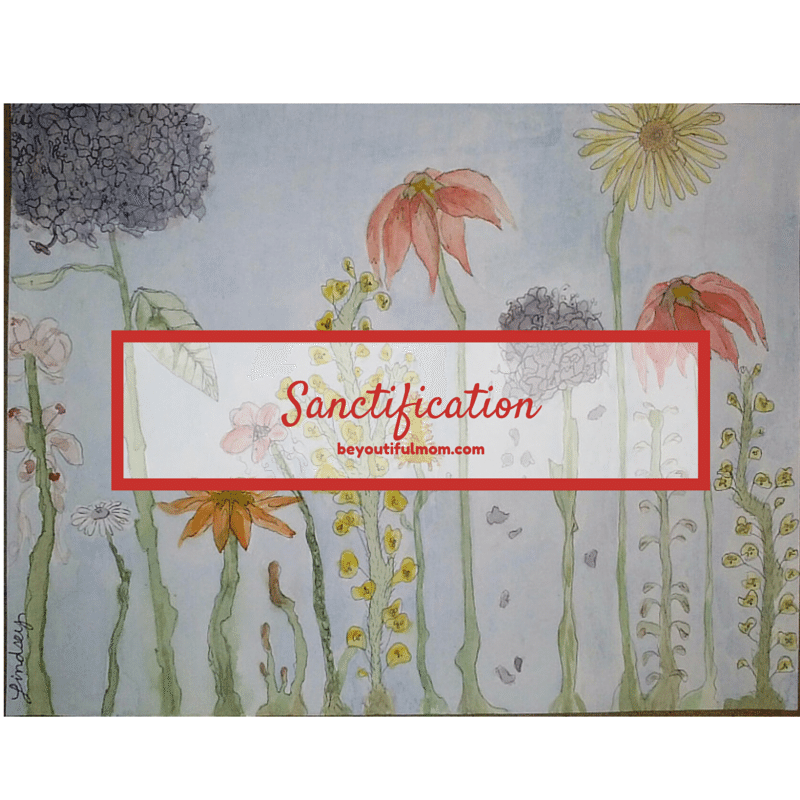 Sanctification is a word that can be further linked to regeneration, justification, grace and faith. It is the process by which the Father dedicates His love and uses His Holy Spirit to apply the work of redemption to a person who puts their faith in Jesus Christ. Sanctification is the process of setting sinners apart from sin and purifying them for God’s service or His call on a believer’s life. Sanctification is in reference to the change brought about by God in a believer, it is begun at the point of salvation or justification and continues throughout the life of the believer. Keep in mind that a person cannot sanctify them self. They must be made holy through God alone. God’s Spirit does the work of sanctification in the believer. He alone is holy. He is separate, distinct, other. We cannot share the holiness of God’s nature. Scripture is filled with the call to be holy as God is holy. Another word for a holy person is a saint. We are called to seek holiness even though we never reach the perfect holiness that God possess. The concept of sanctification is tied closely to that of grace. 1 Peter 1:2 (NASB) says – according to the foreknowledge of God the Father, by the sanctifying work of the Spirit, to obey Jesus Christ and be sprinkled with His blood: May grace and peace be yours in the fullest measure. Take a moment to further look at the bible verses referenced here: each one helps to bring greater meaning to the term sanctification. Choose one and comment about how it deepens your understanding of today’s word. Great insight on the word ‘sanctification’ Misty! This is an often misunderstood word, and its place in scripture holds deep value for us:) Oh, and I’m a teacher and Texas girl too! Understanding certainly deepens appreciation for all that we have in Christ! Nice piece on a not-so-easy subject. You explained it well! Joining you from Women With Intention. Misty nailed it for sure! Thanks for stopping by, Pam! It is a tough subject and Misty handled it beautifully! Pingback: Do You Need a Do Over?